As determined by its name, this swan is almost completely black with greyish fringes to the body and wing feathers. 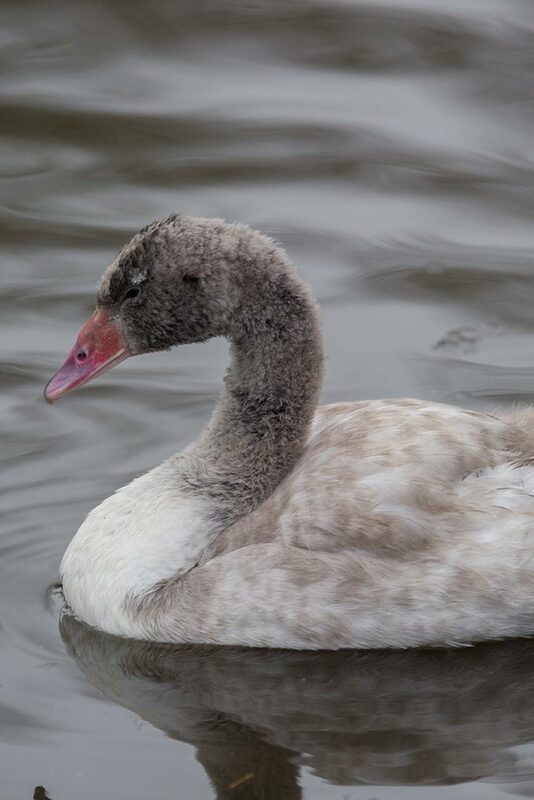 The primaries and outer secondaries are white, contrasting greatly to the rest of the plumage whilst the bird is in flight, however they are concealed when the swan is on water. 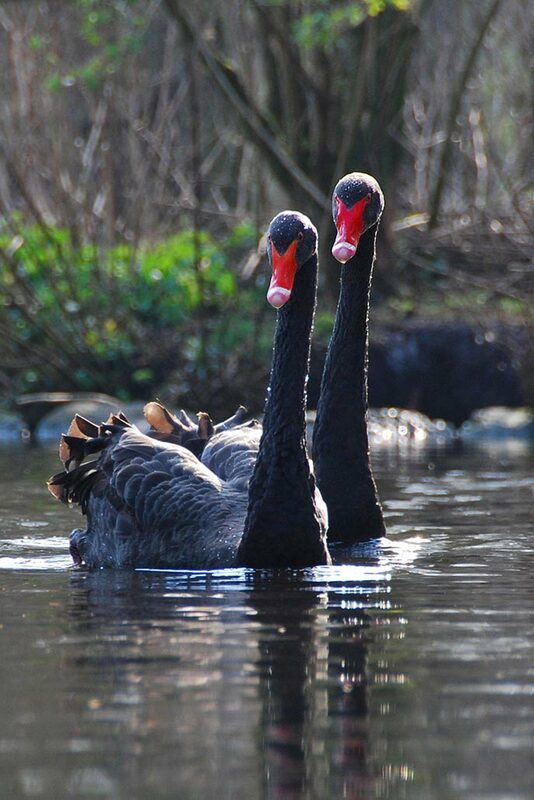 The Black Swan has a red bill with a white band, black legs and feet and red eyes. In the field they are easily identifiable as they are the only black swan to occupy Australia. Mute Swans can occur in the same range, but adults are easily determined. Juveniles of the Black Swan are grey but still much darker than the Mute juveniles, so should be easily distinguished. Cygnets have an almost black bill, aside from the light grey tip. Feet and legs are dark grey, turning black as they mature (Nelson 1976). Black Swans have quite a large vocabulary with the adult call being a soft musical bugling (Marchant & Higgins 1990). Whistles and soft tones are used between birds, and loud hissing adopted when defending young. Cygnets have less of a vocabulary to begin with, using a series of cheeps and adjusting volume depending on the situation. They have one body and wing moult a year, and this can occur at any time of the year. Non-breeders tend to moult towards the end of the nesting season (before breeders moult) although in some parts of their range the species can breed at any time of the year. The Black Swan is unique to Australia and is widespread across the country, though rare in central regions. It breeds widely throughout the range, wherever conditions are suitable, though it favours South Eastern and South Western regions. It is vagrant as far as Papua New Guinea and Irian Jaya (Beehler 1980; Parry 1989). The species was also introduced to New Zealand in 1864 and 1868 (Marchant & Higgins 1990) and the species is now widespread in both the north and south islands of New Zealand. From: Wetlands International 2016, (1) Jaensch 2005, (2) Kingsford et al. 2012, (3) Porter & Kingsford 2011 and (4) Jaensch 2012. 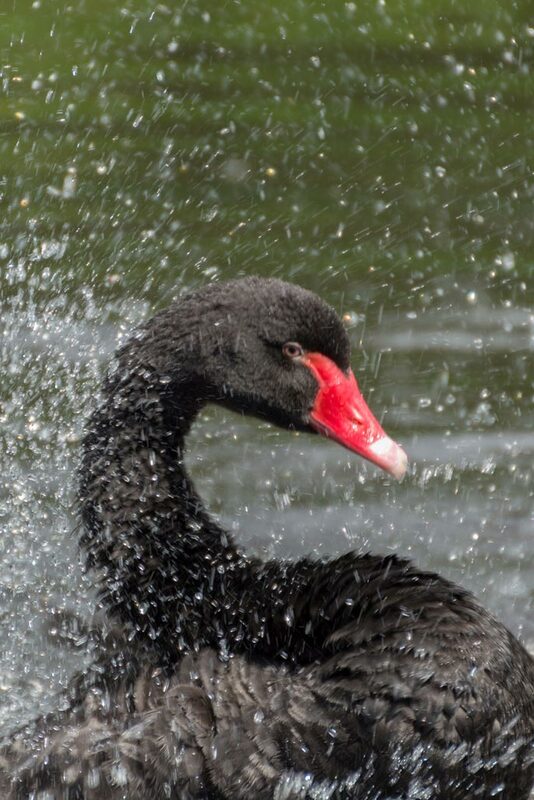 The Black Swan is found in temperate and tropical wetlands, sheltered estuaries and maritime habitats. During breeding season it is found in fresh, brackish or saline wetlands that have fair amounts of soft vegetation to nest build and open water to feed (Marchant & Higgins 1990). Outside breeding seasons the Black Swan is also found on flooded agricultural land, sheltered bays and estuaries, wherever there is aquatic vegetation or soft terrestrial herbage. Dry ground is generally avoided (Briggs 1979). 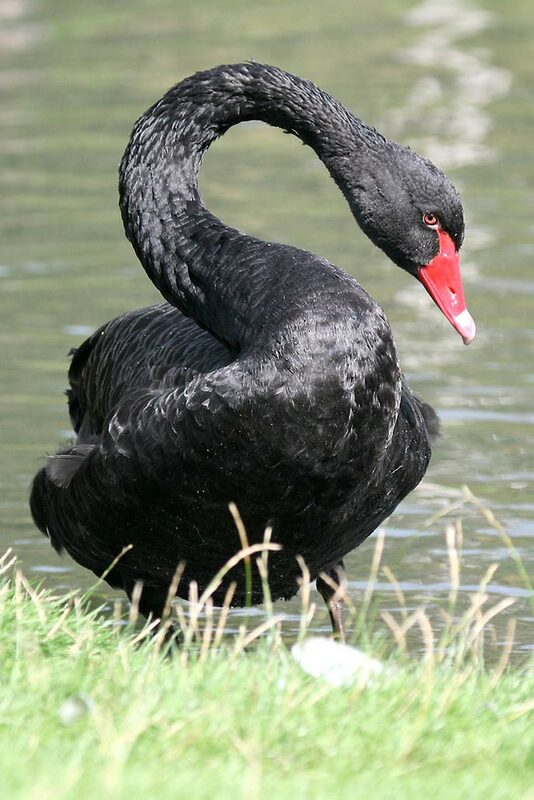 The Black Swan is protected in New South Wales, Australia under the National Parks and Wildlife Act 1974 (Johnson 2011). Protected by law and sentiment in Australia (Madge & Burn 1988). Human hunting for sport and food. Taken for pets and animal displays (BirdLife International, 2012). Briggs, S.V. (1979). Daytime habitats of waterbirds at four swamps on the northern tablelands of New South Wales. Emu 79: pp.211-214. Jaensch, R. (2005). Detailed data and notes on numbers and distribution of waterbirds in Australia, updated from Jaensch, R. (2003). Jaensch, R. (2012). 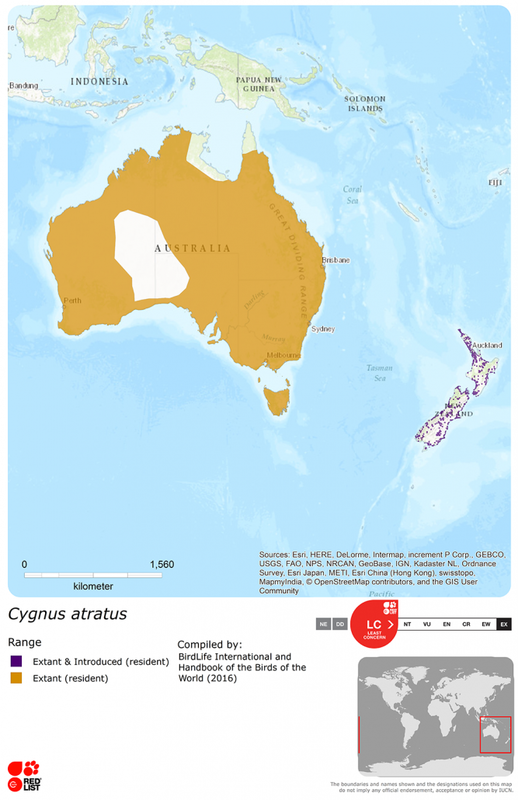 Detailed data and notes on numbers and trends of waterbirds in Australia and other parts of Oceania region. Wetlands International WPE 5th Ed. Kingsford, R.T., Porter, J.L. and Halse, S.A. (2012). National waterbird assessment. Waterlines report, National Water Commission, Canberra, Australia. Madge, S. and Burn, H. (1988). Wildfowl: an identification guide to ducks, geese and swans of the world. Christopher Helm, London. Marchant, S. and Higgins, P.J. (eds) (1990). Handbook of Australian, New Zealand and Antarctic Birds. Volume 1: Ratites to Ducks. Oxford University Press, Melbourne, AUS. Nelson, C.H. (1976). A Key to Downy Cygnets with Analysis of Plumage Characters. The Wilson Bulletin Vol. 88 (1), pp.4-15. Parry, D.E. (1989). Black Swans at Merauke. Kukila Vol. 4 (1-2). Bogor, IDN. Porter, J.L. and Kingsford, R.T. (2011). Aerial Survey of Wetland Birds in Eastern Australia – October 2011. Annual Summary Report, Australian Wetlands and Rivers Centre, University of New South Wales. Johnson, S. (2011). Black Swans. Available from: https://www.beautyofbirds.com/blackswans.html [Accessed Feb 2018].